What started out as a 2.5 ton 24 foot long iron sculpture is now transforming into a limited edition bronze Buffalo head sculpture! The piece, titled “Herd Bull,” was created by artist, Benji Daniels, and is one of only five that will ever be made! Daniels is a storyteller, but unlike traditional storytellers, he tells his stories through sculpted iron and bronze. 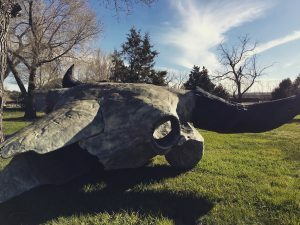 Daniels, who has been formally sculpting since the 1980s, individually cast each piece, and like a bronze puzzle, welded them together to create the breathtaking full skull of the buffalo. Through the sculpture, the artists own background and emotions are clearly displayed in this bronze replica. The magnificent “Herd Bull,” located on 3rd Ave right next to Roosevelt’s Outpost, Medora’s best place to shop for Outdoor Adventure Gear, is not something you’ll want to miss! This great piece of art will definitely be something to remember, and is a great new photo opportunity in Medora this summer!